Rose Williams has set out to lighten things up a bit with this offbeat history of Rome. Williams knows Rome having spent the best part of her life trying to instill Latin in young ...minds and having written several textbooks and lighter treatments of the ancient language. 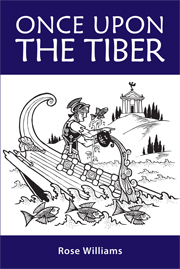 It is not necessary to know Latin to appreciate 'Once Upon the Tiber'. It helps, though, if you have an interest in Roman history -- and a healthy sense of humor.